Click the image below to view the full brochure. 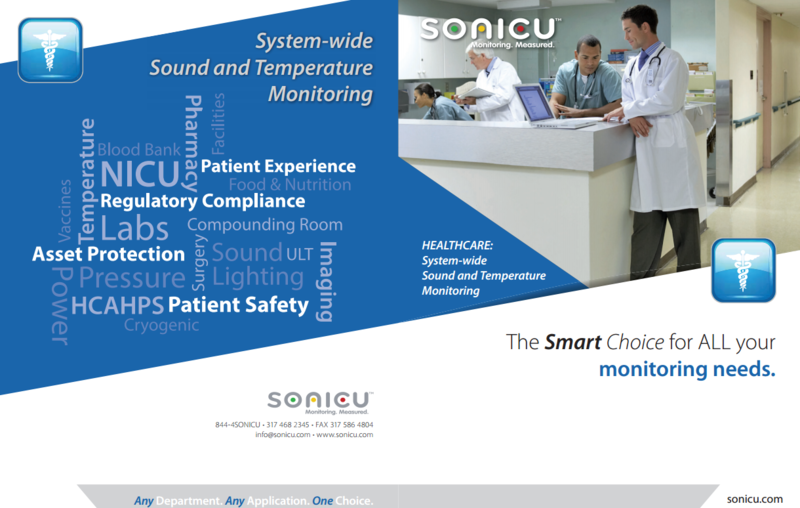 Hospital noise reduction and remote temperature monitoring are two ways Sonicu is helping healthcare improve patient experience and efficiency. But those are just small parts of a much bigger picture. Humidity, +/- air pressure, power and a host of other variables at any number of points can be monitored with Sonicu's System-wide Monitoring Program for healthcare. Download our free System-wide brochure to discover how one wireless monitoring platform provides remote monitoring, 24/7/365 protection and alarming and automated reporting for your enterprise.